How much money should you expect for your back injury settlement? People are uncomfortable asking that question, but it is -- and should be --- the primary question of anyone bringing an injury claim. Bringing a claim is not going to lessen your pain. All the civil justice system can offer you is money. The median plaintiff's verdict award for car and truck crash cases that involved back injuries is $212,500. But what about your case? The value of back injury cases depends on the type of injury. At the top of the value chart is clearly spinal cord injuries. Assuming adequate insurance, these cases are typically assessed in the millions. 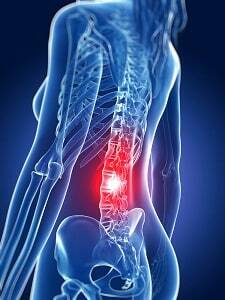 (3) what the physical symptoms are of the back injury and how the victim's life is impacted by the injury. Obviously, the credibility of the plaintiff is critical in a personal injury case. It is as trite as saying that the key to winning a basketball game is putting the ball in the basket. But this familiar trope it is particularly true in back injury cases. Why? First, juries come at back injuries with a healthy skepticism. It is the cliche motor vehicle accident injury. Moreover, with back injuries, the extent of the injuries often don't line up with the radiological findings. I have medical experts tell me that the patient back is an absolute wreck, but the patient is clinically doing quite well. Conversely, I've seen small disc herniations that I'm 100% convinced have caused an injury that causes pain to the victim 24 hours a day. So, if an out-of-court settlement cannot be reached, the plaintiff needs to carry the ball at her deposition, and, if necessary, at trial. Ultimately, as you can see, there are a lot of variables at play in valuing these cases. There is no calculator or formula to compute how much money you can expect in a settlement. But we can learn more about the range of settlements and the links below help you find the answers you are trying to find. The toughest back injury cases involve preexisting injuries. The most common battle is in herniated disc injury cases because many of us have compromised discs but may have no physical manifestations of injury. The insurance companies argument is that the plaintiff's back was already a mess at the time of the car accident because the MRI show injuries or degeneration that were likely before the accident occurred. But favorable settlements and jury verdicts can be had in many cases with previous injuries. Ultimately, the law in Maryland is that your compensation should be the difference between your condition before the crash and your condition after, assuming the accident caused the change in the condition. Common sense is on our side here, too, right? If you did not have pain before the crash and you have pain after the accident, it is not too difficult to add two and two together. So how do you win these cases? The key is having an attorney and doctors who can articulate the difference between your problems and treatment before the accident and your current condition. If the crash trauma did not cause a change in your condition, your chances of getting a favorable settlement are slim. If, on the other hand, there is an evident change in your injuries from before the wreck, the likelihood of a quality settlement is quite high. That said, these are the types of cases insurance companies want to fight. Most of our cases settle before we ever file a lawsuit. Is this true with our back injury case with pre-existing injuries? No. We usually have to slug it out with them for at least a while to get fair value or better. 2017, Maryland: $265,000 Verdict. Our client has a preexisting back injury that is exacerbated in a rear end accident. She requires five epidural injections. The defendant claims she would have needed this treatment anyway. The case settles two weeks before trial. 2017, Maryland: $10,000 Verdict: Plaintiff, a 32-year-old customer service rep, was rear-ended by a Montgomery County Ride-On Bus at the Metro service exit on the ICC. Plaintiff sued the County alleged lumbar disc herniations. The County admitted liability for the accident but disputed whether the back injuries were actually the result of the accident. The jury awarded damage of $10,000, which was significantly less than what Plaintiff was seeking. 2017, Maryland $60,000 Verdict: Plaintiff was a 34-year cheerleading coach. She was rear-ended on Route 27 in Mount Airy and allegedly suffered cervical disc herniations with radiculopathy. Liability was admitted and only damages were at issue. The jury in Carroll County awarded $60,000. 2017, Oregon: $618,000 Verdict. Plaintiffs are traveling in their vehicle and are stopped at a red light. Defendant's vehicle, a large gas truck, strikes the rear of their vehicle. As a result of the collision, one plaintiff sustains neck and back injuries including disc bulges requiring surgery as well as headaches and vertigo. He alleges the possibility of future fusion surgeries. The second plaintiff sustains a facet joint injury in his back that requires ablation procedures every six months and alleges the possibility of a future back surgery. A jury returns a verdict of $313,000 in economic damages for the first plaintiff and $231,000 in economic damages for the second plaintiff, in addition to $37,000 in non-economic damages for each. 2016, Texas:$548,692 Verdict. Plaintiff is in his newly leased residence investigating the second-floor loft area. He opens the door to the loft and finds no light fixtures. He opens another door, again with no light fixtures, and steps in, assuming there was plywood flooring. Due to a lack of flooring behind the second door he falls through thin sheetrock ceiling onto the concrete garage floor, twelve feet below. An ambulance transports him to the hospital where he is diagnosed with fractures in his thoracic and lumbar spine. He is immobilized for the next three days. He sues the owner and lessor of the property alleging that they violated state law by failing to warn him of the dangerous condition. A jury finds that plaintiff is 25% liable for his injuries and that the owner and leassor of the premises were 75% liable. The jury awards plaintiff $548,691.66 which is reduced to $411,518.74 per fault apportionment. 2016, Texas:$400,000 Settlement. A 53-year-old man is driving his compact car. Defendant, driving his vehicle the opposite direction on the same road, attempts a left turn in front of plaintiff. This causes plaintiff to strike the passenger side of defendant's vehicle. He is taken to the ER is diagnosed with multiple compression fractures in his thoracic spine, along with a herniated disc and a disc protrusion. Eventually he has back surgery. He sues the defendant, alleging negligence in failing to yield the right of way and failing to keep a proper lookout. The defendant does not dispute liability but argues that the man's back injuries were degenerative and pre-existing. The parties settled after mediation for $400,000. 2016, Kansas:$273,063 Verdict. Plaintiff, a man in his 60's, operates a trucks in the course of his employment. He opens the trailer door to inspect the cargo, which had been loaded by defendant employees, when a drum weighing 40-50 pounds springs from the trailer and strikes the top of his head. This causes him to fall and he is taken to the hospital by an ambulance. He is diagnosed with a fracture in his spine as well as compression fractures in his thoracic spine. He is immobilized for the next few months. He sues defendant alleging the negligent loading and securing of the drums. The defendants admit they did not secure the drums but argue that they did not have an obligation to. A jury found that the plaintiff was 25% liable for his injuries and that defendant was 75% liable. They awarded plaintiff $273,063.30 which is reduced to $204,797.47 due to contributory negligence. 2016, Oregon:$49,367 Settlement. Plaintiff is driving her vehicle when it is struck by defendants in an intersection. The woman sustains a back fracture in addition to cervical strains. The defendant fails to appear for arbitration and the woman is awarded $49,367, which includes $20,228 in non-economic damages. 2016, New York:$45,000 Settlement. Plaintiff is operating his vehicle when he stops for traffic. He is rear-ended by defendant's sports vehicle and injures his back. At the hospital, x-rays reveal a compression fracture in his thoracic spine in addition to aggravation of pre-existing spinal conditions. Defendant argues that he was driving safely but that he could not have avoided the collision due to his vehicle skidding in wet conditions. Prior to the start of trial, the parties settled for $45,000. 2016, Washington:$32,500 Verdict. A minor girl is horseback riding. Suddenly, defendant's Australian Shepherd dog startles her horse. This causes the horse to throw the girl to the ground. The girl fractures her back. Her parents allege that defendant rode away on his bike with his dog after the girl fell. The defendant disputed liability, claiming him and his dog did not do anything to cause the incident. After a three-day trial, a jury awarded the plaintiff $32,500. 2016, Oregon:$30,000 Settlement. Plaintiff is traveling through an intersection when defendant approaches the same intersection. Defendant proceeds through the intersection, colliding with plaintiff's vehicle. Plaintiff sustains a vertebral fracture as well as a head injury with cognitive loss. The parties settle the case for $30,000. 2016, Michigan:$14,500 Settlement. Plaintiff is a customer at defendant's spa. While waiting for a pedicure, an employee instructs her to sit on a stool. Plaintiff sits on the stool and it collapses, causing her to fall onto the floor. She injures her thigh, mid-back, and lower back as a result. Plaintiff is diagnosed with a compression fracture in her thoracic spine and treats with a pain management specialist. She sues the company, alleging they were negligent in failing to warn customers of the defective condition of the stool. The defendant claims the employees were unaware of the defective condition. After case evaluation, the parties settled for $14,500. 2015, Texas:$652,173 Verdict. A 40-year-old truck driver slips and falls at defendant's restaurant. The area where he fell had been mopped seven minutes prior to the incident. He is taken by ambulance to the hospital, where he is diagnosed with spinal fractures and a fractured tailbone. He sues the restaurant owner, arguing that only one wet-floor sign at the entrance of the restaurant was inadequate as it was not obvious enough. The defendant argued the sign was adequate and that plaintiff failed to properly lookout for his own safety. A jury finds that the restaurant is 75% liable for the man's injuries, and that plaintiff is 25% liable himself. They award the plaintiff $652,173.01 which is later reduced to $489,129.75 due to the fault apportionment. 2015, Texas:$305,000 Verdict. A nine-year-old girl is using a rock climbing wall at defendant's facility. While she is about 20 feet off the ground, her harness comes apart from the cable and the girl falls. She is taken to the ER and is hospitalized for one day, and diagnosed with 11 compression fractures in her lumbar and thoracic spine in addition to several lumbar disc herniations. Her parents allege the company was negligent in failing to provide proper on-site safety and that the employees failed to ensure that the girls harness was safe. A jury awarded the young girl $305,000. 2015, Ohio:$60,000 Settlement. A 65-year-old man is driving his vehicle when he runs out of gas. He pulls over to the right side of the road and turns off his vehicle. Defendant, operating an 18-wheel tanker truck, drifts into the right and strikes the rear of plaintiff's vehicle. This pushes plaintiff's car into a ditch. Plaintiff is taken to the ER and diagnosed with a lumbar fracture. The parties settled for $60,000. 2015, Maryland: $560,000. Our client is hit by a driver taking a left turn. She did not immediately have symptoms and it took years to get a definitive diagnosis of an annular tear. This was a left turn accident case where our client did not have immediate back problems after the crash. State Farm rolled its eyes at the claim until about two weeks before trial until an experienced adjuster came to his senses and put real money on the case. 2015, Maryland: $20,000 Verdict. An adult male is a passenger in defendant's car. The car strikes a pole and plaintiff fractures his back and ribs. He claims that defendant was negligent in driving at an excessive rate of speed and in failing to obey traffic signals. Defendant denies the allegations. A jury awards the plaintiff $20,000. 2014, California:$49,910 Verdict. An adult woman is operating her car when she is struck from the rear by defendant's vehicle. She fractures her back and has soft tissue injuries. These injuries require neurological and chiropractic care. She files a claim against defendant, alleging negligence in the operation of the vehicle. The defendant admitted liability but disputed the nature and extent of plaintiff's injuries. A jury awarded the plaintiff $49,910. We fight to get our clients who have suffered severe back injuries the value they deserve: either by settlement or at trial. Call us to discuss your case at 800-553-8082 or get a free on-line consultation.